The New Zealand woman’s Netball side, the Silver Ferns have completed two of the biggest wins in their current Quad series. The Ferns rounded off their Quad series with a massive 31-point victory over the scrappy South African side in London. Their latest win followed hotly on the heels of anther truly impressive performance against England, which saw them thrashing the Brits by 24 goals one week earlier. But despite their impressive results, the Ferns look back with frustration at the start of the series, morning their loss to Australia now more than ever. While the New Zealand side did everything they could to give themselves a chance to make the finals, it almost looked like England was going to help them out. In a match against Australia, it looked as if the Brits were going to pull off a surprising win against the Aussies but it was not to be. The Diamonds managed to just edge ahead of the home team with a nail-biting 47-46 victory. The match against Australia was the most excitement we had seen from the English Roses since the start of the competition. After needing extra time to defeat the flailing South Africans, England were then hammered by New Zealand only to face an even more determined Australian Side. Meanwhile the Ferns had been expecting a bit more of a fight from South Africa who has been on the rise since former Australian Coach Norma Plummer joined the side. The South Africans pushed hard in the opening period, giving New Zealand pause for though. The fiery Proteas came up with some good defence while the Fern struggled to find their own rhythm. At the first break, three goals separated the sides with Selby-Rickit and Te Paea making up the difference. In the second half, the Ferns found their feet and kept the South Africans at bay for the remainder of the game. As the match wore on, New Zealand became more and more dominant, taking advantage of a tiring South African side that showed signs of frustration and fatigue. In the end the Ferns proved too powerful for the Proteas and executed another massive win beating the girls in green by 79 points to 39. Despite their impressive win margin, the girls still believe that there are areas which needed work which was highlighted by the unforced errors in the first half. Silver Ferns Go Down to Australia in Constellation Cup Opener The Silver Ferns have gone down to the Australian Diamonds in the netball Constellation Cup Series opener. With the game …. 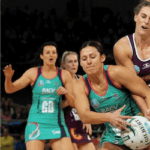 Vixens Vs. Giants At Suncorp Super Netball The head coach of the Melbourne Vixens, Simone McKinnis, has stated that she is currently in full team training mode for the Suncorp ….